I am your guide, I am your example, and I am your mirror for complete transcendence as you clear the remaining impurities of the 3rd Dimension to find your gateway to the 4th, 5th and Higher Dimensions waiting and open for your transcendence. Take these building Solstice energies and utilize them now, dear ones. Allow them to mingle within you and to fill your heart and your cells with purity as you invoke the violet flame of purity and transmutation, wiping away all traces of yesteryear, all traces of what once was, of what used to define you. See the clear mirror now of your existence – The clear pure essence of your existence. Switch over to that version of yourselves, now, dear ones, for it is time. Feel the purity and clarity of you, of all your aspects, of your I AM Presence descended now and engulfing your existence, of your divine perception of yourself, your true self, forever and always, dear ones. I take you on a little journey now. Encompass and utilize this intense energy of the incoming Solstice Gateway and touch it, feel it, and welcome it as your true guide to Transcendence. Feel the clear purity of the energies and allow them to infiltrate you, to saturate you, to bring you along a path of least resistance to pure Love and Harmony and Balance and Peace. You are ready, dear ones. You are prime for it. Just allow it. Sit with it in quiet still moments of innocent curiosity and acceptance of your new identity, becoming more and more apparent to you now. It is not always going to be apparent, but if you will it so, it shall be so. And so this journey I take you on is to get you acquainted with your New Self, your wide expanse of energy and brilliance that is touching everything around you. Allow it to touch everything around you, to color your perceptions now, this clear pure energy of Transcendence, of arrival into the higher dimensions. I take you there with me now. Feel the purity of it. Feel the softness of it, feel the highest vibration of it. This feeling is not new to you. For you experienced it as your norm many eons ago. So get acquainted again. Live in it again and don’t forsake yourself. Don’t analyze it, but just allow it to overtake you as you sit in your quiet moments and embellish yourselves with it. “I welcome my higher aspects, I welcome my I AM Presence, I welcome my Christ Consciousness, I welcome Love into every cell of my body and I allow the vibration of each of my cells to attune to the pure essence of my Soul, to the pure essence of Source, and I welcome and become accustomed to the higher vibration that this entails, now and forever, and in this Now Moment of pure Love Essence, affecting every part of me now, every cell in my body, every fractal of myself, every aspect of myself, as I merge with all of me, now and forever. I AM attuned to Source and I accustom myself to this vibration, now and always, and in this Now Moment, now and forever. Now feel the purity of this invocation and be with it now in your incoming breath and in your outgoing breath. Breathe with Source, BE Source, Now and forever, complete and always. Now feel yourself become aware of every cell coming alive and bright and shining in your new Purity and Divine Essence that has always been yours. Feel it rise above the depths you have been living in since your Fall into the lower dimensions, and reclaim your rightful essence and identity as pure clear Souls of Divinity, meshing with Source and becoming alive within it. 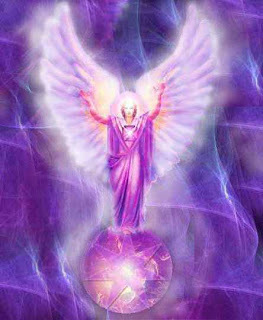 This entry was posted in Archangel Messages, Archangel Zadkiel, Fran's Channeled Messages and tagged 5th Dimension and Beyond, Archangel Messages June 2014, Archangel Zadkiel, Ascension process, Channeled Message June 18 2014, Divine Emergence, Fran Zepeda, I AM Presence, Light Bodies, Love Essence, Love Harmony Balance and Peace, Now Moment, Purity, Solstice Energies June 2014, Source Essence, Spiritual Awakening and Transformation, Transcendence, Transmutation, True Divine Essence, Violet Flame. Bookmark the permalink.